the left inboard stabilizer doesn't have a rudder but the right one does. The C-2 has four vertical stabilizers, of which three are fitted with rudders. A single vertical stabilizer large enough for adequate directional control would have made the aircraft too tall to fit on an aircraft carrier hangar deck. The four-stabilizer configuration has the advantage of placing the outboard rudder surfaces directly in line with the propeller wash, providing effective yaw control down to low airspeeds, such as during takeoff and landing. The inner-left stabilizer lacks a rudder, and has been called the "executive tail", as it has nothing to do compared to the other three. The rationale explains the primary design, but no explanation for the "executive" tail. Can anyone explain why the C-2 is designed this way? 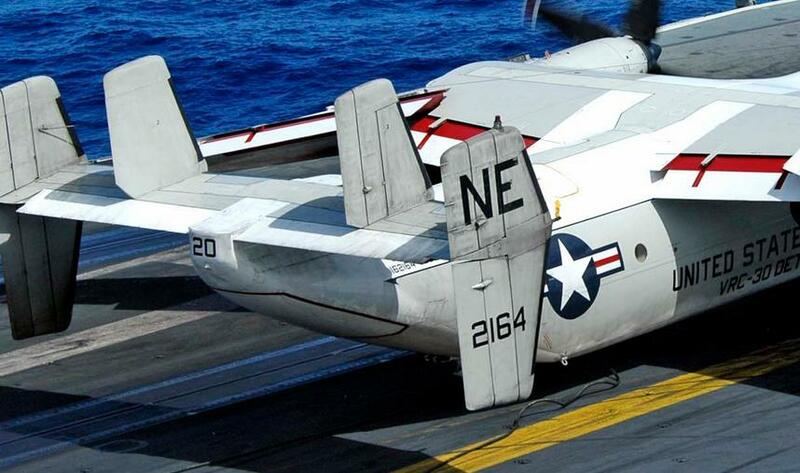 The C-2 was developed from the E-2 Hawkeye (the one with the big radome). The radome disrupts the airflow behind, hence the need for the inboard fins (source), they help stabilize the airflow and act as fences for the outboard fins. Those inboard fins were not needed for the streamlined radome of the earlier E-1 (shown below). Alternatively they could have extended the fuselage length, but they didn't go that way. The three rudders provide sufficient control in single engine operation, yet are overpowering when both engines are working, which caused early control problems and stability augmentation had to be implemented (source: University of Tennessee, MS thesis, 2002). The E-2 and C-2 feature rudder authority limiter as part of that augmentation (C-2A flight manual). And apparently the rudder authority is sufficient enough that the E-2 can turn (to remain in orbit) while keeping the radome fairly level (source). As to why the right one is the one with the rudder, I don't know. The engines are not handed (video). But as far as I know, a normal force on a laterally placed fin does not change the moment arm around the yaw axis, but I'm happy to be corrected. Development information on the E-2/C-2 is scarce, so I hope that's sufficient for the time being, I tried to find as good sources as possible. Not the answer you're looking for? Browse other questions tagged aircraft-design aerodynamics vertical-stabilizer or ask your own question. How does a self-centering rudder affect left-turning tendency? Why does the A-320 allow 1.3 degrees more left rudder trim than right? How does rudder lock occur?